With proper care, even teeth that have had root canal treatment can last a lifetime. But sometimes, a tooth that has been treated doesn't heal properly and can become painful or diseased months or even years after treatment. If your tooth failed to heal or develops new problems, you have a second chance. An additional procedure may be able to support healing and save your tooth. If you have pain or discomfort in a previously treated tooth, talk to an endodontist about retreatment. Occasionally, a nonsurgical root canal procedure alone cannot save your tooth and your endodontist will recommend surgery. Endodontic surgery can be used to locate small fractures or hidden canals that weren't detected on x-rays or during previous treatment. Surgery may also be needed to remove calcium deposits in root canals, or to treat damaged root surfaces or the surrounding bone of the tooth. 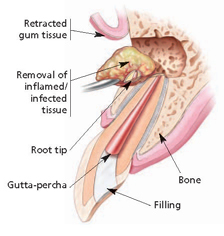 To learn more about endodontic surgery, talk to an endodontist in your area.